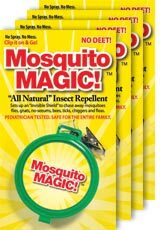 Mosquito Magic - The World's Finest All Natural DEET Free Insect Repellent! What Makes It So Effective and Safe For Anyone To Use? Mosquito Magic® is a blend of 12 flying insect and pest chasing oils formulated into one patented compound that is extremely effective in chasing away flying and biting insect pests like: mosquitoes, flies, gnats, no-seeums, bees, ticks and fleas. It is DEET FREE, ideal for use by people with sensitive skin, and totally safe for adults, children, pets, and horses. including out best selling Family Pack Combo. The perfect easy-to-carry solution for the family on the go! 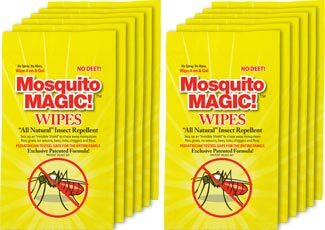 Each Mosquito Magic® wipe comes in an an easy-to-open foil pouch. Remove and rub the pleasant scented towelette lightly over exposed limbs and skin area for safe, all-natural protection from mosquitoes and a variety of flying/biting insects. After use place into a ziplock plastic bag and reuse for up to 30 days. Price $24.95 USD - FREE shipping to continental US. 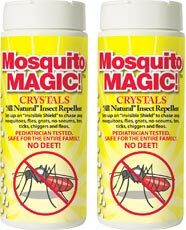 The original Mosquito Magic® product that started it all is also the easiest to activate and use. Just peel off the top label, clip it to your belt or pocket, and minutes later enjoy safe, all-natural protection from mosquitoes and a variety of flying/biting insects. No mess to clean up. After use place into a ziplock plastic bag and reuse for up to 14 days. Price $26.95 USD - FREE shipping to continental US. Getting outdoor protection from flying insect pests has never been this easy. Simply pop open the top on the plastic dispenser, shake out some Mosquito Magic® Crystals around the edges of your activity area and enjoy! The Mosquito Magic® Crystals Shaker is the perfect solution for any outdoor event or activity where added protection from mosquitoes and flying pests over an area is desired. Apply 1 hour beforehand for maximum effectiveness. Price $38.95 USD - FREE shipping to continental US. Our best value Mosquito Magic® product combo was designed to give parents a way to provide continuous protection from mosquitoes and flying pests all Summer long at a very reasonable cost. It includes 1 Mosquito Magic® Crystals shaker, 4 Mosquito Magic® Clips, and 12 Mosquito Magic® Wipes. This combo is the perfect solution for any family going on vacation, a trip to the lake, park, concert, or for protecting everyone around the home during Summertime from flying pests! Price $54.95 USD - FREE shipping to continental US.